One of the toughest things about moving to a new area has to be figuring out how to get around. A GPS can certainly help you find your way but there are some things that the GPS does not know. These are the things that only the locals who travel the Spring Texas roads day in and day out know. To help you find your way, I am going to share with you my tips on navigating our roads. Hopefully they will make your transition to the Spring Texas area just a little easier. 1. Not all roads go through. Ella, a main North – South route, stopsat various points and then pick up again. Ella stops South of Cypress Creek and picks up again North of Cypress Creek. 2. The shortest distance between two points is not always the fastest. If you are wanting to get from FM 1960 and I45 to FM 1960 and 290 a map would indicate the shortest distance would be to travel west across FM1960. Is it the shortest distance? Yes. Is it the quickest route? No. The drive across FM 1960 is filled with stop light after stop light. A quicker route is to drive I45 South to the Beltway, take the Beltway West to 290, and then take 290 North to FM 1960. 3. Avoid delays get an EZ Tag. Some day you will want to travel on one of the area toll roads. Before that day arrives do yourself a favor and get an EZ Tag. The EZ Tag gives you the power to go whizzing by while avoiding the long wait in line to pay the toll. Plus with the toll charge being less for EZ Tag users, the EZ Tag will save you time and money. 4. Highways have more than one name. Adding to the confusion of navigating around the area is same road or highway having numerous names. Such as the outermost loop around downtown Houston is known as the Beltway, Beltway 8, Sam Houston toll way, and the Sam Houston Parkway. I45 North is also known as the North Freeway. U.S. 290 is known as the Northwest Freeway. The innermost loop around downtown Houston is known as the Loop or the 610 Loop. 5. Learn the major East – West and North – South thoroughfares. The major North – South roads are I45, Kuykendahl, Stuebner Airline/Veterans Memorial, Champion Forest, and 249. The major East – West routes are FM 1960, Cypresswood, Louetta, Spring Cypress, and FM 2920. What’s the FM in FM 1960 and FM 2920 stand for? The FM is an abbreviation for Farm-to-Market. These were the roads the farmers traveled to deliver their goods to market. 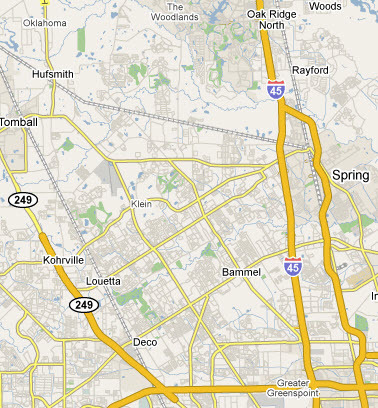 Click here or on the image of the map of Spring Texas for a closer look at our area roads.